In the year 1999, Philip J. Fry was kind of a loser. He had a dead-end job as a delivery boy at Panucci's Pizza, a girlfriend who was probably cheating on him and a crippling addiction to caffeinated cola. In the year 3000, he's got it made! He's got a sweet job as a delivery boy, he's got a cyclops girlfriend who breaks up with him every other week and a crippling addiction to Slurm. Alright, so maybe on paper, it sounds like Fry's life hasn't changed all that much; he still wears the same red jacket and blue pants, he still has that messy red hair and he still has a brain that even a Brain Slug can't feed on. But he did meet a drinking, smoking and swearing robot named Bender who is now his best friend and now his deliveries take him across the galaxy in the Planet Express ship, so we'd have to say that he's doing alright. 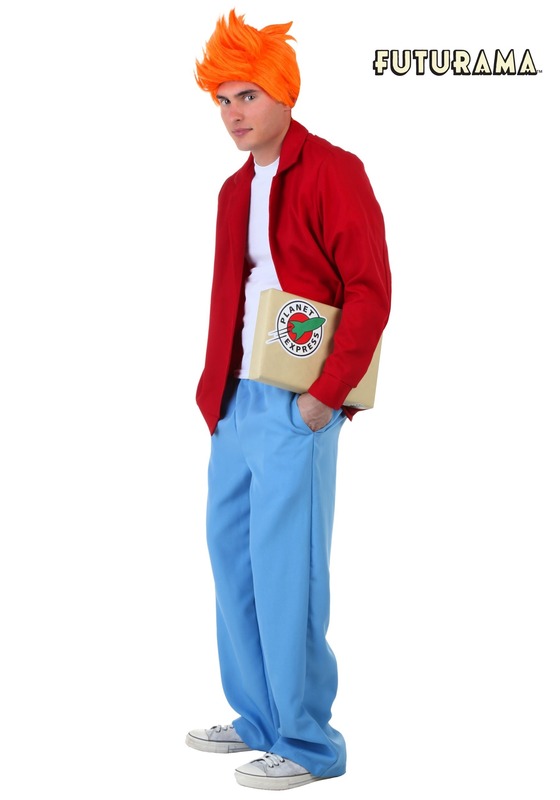 Unfortunately, we don't own any cryogenic freezing tubes to make your wish of having Fry's life come true, but we do have this costume that recreates his look from the classic series.